Your biggest problem is the choice of art style. You need to go for a style that fits the tech. There are different voxel technologies, each with its own pros and cons, and if for whatever reason this kind of grass is a must, you should look into voxel techniques not based on poly meshes, but on a pixel conversion from a 2d heightmap, as was done in earlier eras. But given what you are working with, and that I personally think this kind of random noise grass aesthetic is not a desirable look to begin with, you should go for a more comic style. It's all about conserving your details for where it matters most visually. It can look surprisingly rich if done by a good artist. This is NOT art. This is realtime 3d rendering with lights and shadows. I need no other techniques, bcuz i choiced 1 voxel = 1 pixel! who did this before ? also I wrote my own light shader (light and shadows) that matching my palette. So actual colors available for "art" reduced. In example above truck cabin actually filled with 1 blue color, but light and shadow give 2 shades of blue. I understand that. But the point is, given a more appropriate art style, the mesh ends up more efficient. That you have too many tris is an avoidable problem with a proper style. I see at least three shades of blue on the truck. The grass can be simplified by having one large ground plane since there are no areas that go below ground level, and only the "grass blade" voxel towers need to be on their own. This will lower the the triangle count be a good amount. Don't forget to remove the backfaces to those voxel towers as well. Oh, and you can use pixel-perfect cutout alpha clumps for the grass. No compression on the textures, no overdraw, if you subdivide your existing tile sizes into 10x10, I'm almost completely certain you won't even see a difference...and your polycount will go from 2.1million to like...1K? And it will totally run on mobile. Voxels are considered "Pixel Art"? 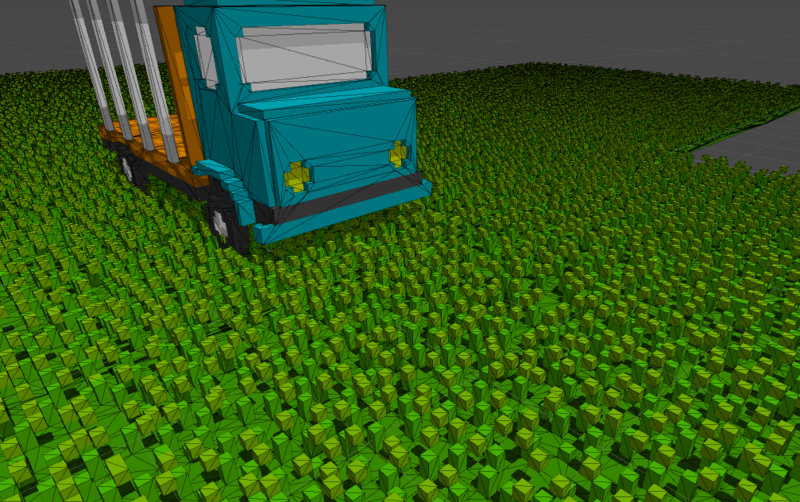 I work also with voxels in qubicle, and I find it super-nice. This thread's over a year old. Voxel art isn't pixel art per se, but it's a related medium, many concepts and techniques are similar between them, so quite a few artists dabble in both. Pixelation isn't just for pixel art, and the 2D & 3D section in particular is mainly for art other than pixel art. Also, you can technically have 2d voxel units (tiles arranged with depth and billboarded, to represent 3d grid positions, overlapping each other as if they were 3d). And these 2d voxels can be made with pixel art techniques, so voxels can be proper pixel art. But now we really are necro-ing the thread.